The Chesla's Revenge is a Limited Edition Tactical weapon. Anna Chesla was a world-renowned inventor and chess master, best known for her patented "Advanced Chess" method. Her final invention, Chesla's Revenge, was named by her followers after her mysterious disappearance who saw it as one last attempt to best her bitter arch-rival, Zugzwang. Ancient rival of Zugzwang, Chesla was never able to defeat the chess master and would frustratingly return time and time again to the Seasonal Garden, biding her time until she was charged up for another attempt. With near perfect mastery of the technological advances of the time, she refused to admit her lack of mastery for chess. With the focus on charging her Amplifier to enter the tower, she couldn't spare much time for focus on improving her chess tactics. Out of her frustration, she had an epiphany! Using her great technological prowess, she quickly built an extremely powerful coil to gather and focus the magic energies of the Seasonal Garden, greatly accelerating her amplification rate! Finally being able to focus her energies elsewhere, she had turned up the power too high in anticipation and overloaded the coils. When the bright glow from the coil finally dimmed, she was never seen again. Scrawled upon the underside of the tower, one can make out the word "Checkmate". The electric energy in Chesla's Revenge has a unique effect on your Tower Amplifier, resulting in an occasional boost in amplifier power. When the Chesla's Revenge trap is used in the Seasonal Garden, the amplifier gained by catching mice there will sometimes be doubled. This boost stacks with the effect of an Amplifier Charm, for a triple charge. ZAP! 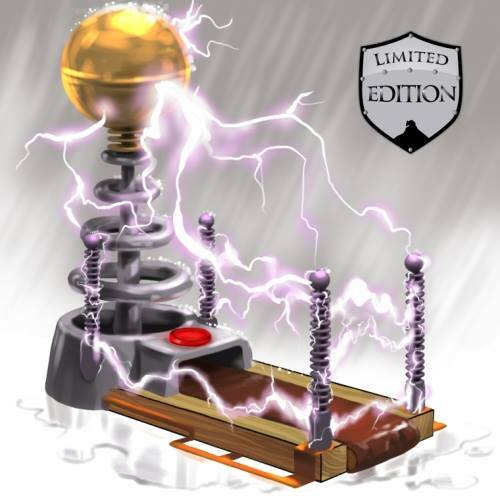 Your Chesla's Revenge trap starts buzzing loudly and a large tendril of electricity bursts outward from the top, adding an extra surge of energy to your Tower Amplifier! Amplifier Charm - When used in Seasonal Garden the amplifier is doubled. The effect stacks with the effect generated by Chesla's Revenge. 14 January 2014: The Chesla's Revenge was first introduced with the introduction of the Season 2 Treasure Chests. This page was last edited on 13 January 2019, at 15:43.